Check that it is the address of your bank in the address bar of your browser before you log on to your internet bank. The web address on the log on page should start with https:// and a padlock symbol should be visible in the browser. "So I remember there was something with an h and a couple of p or t or something I should look for. http://? Yeah, that was probably it. Must be safe." Look for the padlock in the browser? Seriously? You can just include it in the page, don't even need to use the old favicon trick to fool someone reading this advice. Naturally I started to think about what some actual good advice would be to give on this subject, but I found it surprisingly hard. The advice should be (A) short, (B) easy to remember and understand even for a user with little technical knowledge, and (C) apply to all fairly modern browsers. Imagine you have 30 seconds to explain this to a not very-tech savvy relative. While I previously stated that this might be a good option, the world has changed, and the use of EV is no longer a particularly reliable indicator, even given the drawbacks mentioned below. There are articles such as this one from Troy Hunt which explain the full issue, but, in short, browsers are no longer treating EV certificates as something particularly special, and are hiding or reducing the indicators of EV status. Taking the first of the sites shown previously, for instance, gives the following display in, respectively, Chrome 69, Edge, Firefox 62 and Internet Explorer 10. Safari on mobile shows a green padlock and "Barclays PLC", Chrome on mobile shows a green padlock, "https" in green, then the rest of the URL in black. In other words, even if the site does use an EV certificate, there isn't a single indicator that can be easily communicated to a non-technical person anymore. It was always at the mercy of browsers, and it's no longer treated as anything special. So, what's the alternative? 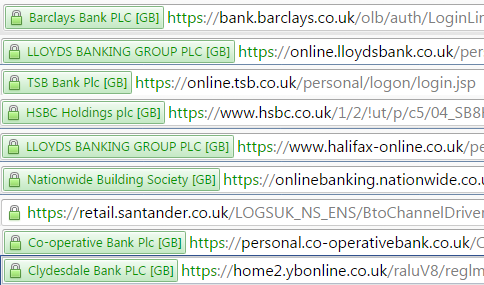 Nothing springs to mind: the URLs below are from a range of subdomains of the bank sites, which makes looking for the bank name harder, and it doesn't work on some mobile devices, which don't show the full URL. The padlock symbol is easy to work around, given the availability of free SSL certificates for domains you control. Browsers mostly currently show "https://", but not "http://" now, but relying on that remaining the case has most of the same issues as relying on the green address bar. That leaves typing the bank address into the address bar each time, and being absolutely sure it's not got typos in, which is not a reliable method either. Searching isn't reliable: most search providers are pretty good at weeding out fake links in adverts on terms like "online banking login", but it only takes one missed link. Following links from the main bank site just moves the verification issue up one level. I suppose it's down to just being careful: use a single device to access the banking site, using a bookmark which has been checked carefully on creation, and don't allow anyone else to access that device, so they can't be modified. It probably makes sense for some people, but I could see that being a too high burden on the average user, where devices are shared with family members or could be accessed by co-workers. I was going to suggest that ensuring that the login screen for the online banking system showed the name of the bank in green, in the address bar might work. But then I started wondering if any of the local banks I know about did that properly. It's less encouraging than I'd hoped. For these nine fairly large banks, 6 provide the name of the bank in the EV cert bar. 2 provide the name of the parent group (which might not always be obvious), and one doesn't even have an EV certificate. The EV certificate is designed to make this easy, if it's used properly - you can't fake it easily, and it's outside the page area, so can't be inserted by a malicious actor. However, it seems that banks aren't doing so well at using it.. There is no action that can be taken that is economically viable. Put another way, it's too effortful to defend against phishing attacks. See 'So long and no thanks for the externalities' for an example on the US economy and information workers. You are correct that checking for URL correctness is error-prone, and HTTPS passive security indicators are a big joke. They go unnoticed, they have for years been meaningless (what does it mean if the keypad is blue or green or grey!? ), and were they to be more prominent / active, people would get habituated to see them and attacks could simply buy a certificate for a rogue URL so that the name checks out. The solution to this issue must be architectural, rather than rely on wasting the time of humans and on said humans to not make mistakes. Why is it that Web browsers don't have a centralised, trusted repository from which to verify the URLs of banks and reputable payment/transfer websites, so that unique security indicators can be used for such sites? I would tell people to go onto the website once, make sure the URL is correct once (you can help them), and save it in their favourites. And use exclusively the favourites button so they know they are on the right website. I would tell them (without details) that you never know where you'll land when clicking a link or searching for a website but the favourites button always takes you to the right place. How? Doesn't matter. At this stage, users are guaranteed to land on the correct URL. If an active MITM attack is occurring, they will get the scary certificate warning, which they normally don't have for their banking website. Warning habituation is a very real thing, and figures are missing to determine whether users would pay attention to it in the context of a previously trusted banking website. Improving on this warning (e.g. making it scarier for bank sites) would also require knowledge of what is and isn't a bank's website. "I am asking how to explain to an ordinary user how to check that the browser is using HTTPS and that you are on the right site..."
Other approaches like the "green name" in EV certs are helpful but not all banks use them because they are much more expensive and take more paperwork to implement (to prove who you are) than a standard SSL cert. Two things I'd add to the discussion are to maybe focus on how people get to the banking site. If they're getting there via a bookmark (ok as long as you always use the same computer and browser), or via the bank's mobile app, or by typing in the (hopefully short and spelled correctly) url of their bank each time, then they're much less likely to encounter phishing or MITM attacks. However if they're responding to a link in an email claiming to be from the bank (always dubious), or off a search engine's results, then they should be extra cautious or avoid these avenues altogether. The other thing I do with my clients is to warn them of the consequences if they get careless... like discovering transactions they didn't make and/or money gone from their account, transferred to countries where recovery might well be impossible (such as Russia or China). Basically, a little fear/paranoia can go a long way toward keeping folks vigilant and their accounts safe. Hope this helps! Essentially your question is one of authentication. In this case, it's users authenticating the bank website is actually the bank. I think you're right, and the user is going to have difficulty in authenticating the bank through the URL (many banks have multiple URLs for instance). You're also correct that users aren't terribly sophisticated about URLs, and don't (and can't be trained) to understand it properly. The user does a pre-authentication by entering in a username, and an answer to a security question. The website displays an image, word, or both that the user has selected. This provides assurance that the bank is actually the bank, since only the bank knows the image or phrase that the user has chosen. The user then enters the password. I like to rely on the auto-fill feature of my password manager for this check. The rationale is that I will not be clever enough to match the site URL in the browser to the expected one, while a password manager will. So when I see that it has filled in the entry for the site - the site is genuine, otherwise I should start to worry. The password manager must of course be "good", but that is another problem. Steve DM's answer (checking and bookmarking the page) is better from an absolute security standpoint, but another viable (and possibly more user friendly) option is to tell them to Google the bank every time instead of clicking on a link. This way, you rely on Google taking you to the right place rather than some shady link and your observational skills. It's easy, and something your friend already does on a regular basis. NOTE: This is still susceptible to MITM attacks, but it will prevent basic phishing attacks. I'd just tell a non-tech savvy person to always Google their bank (and other sensitive sites) and to not log on to sensitive websites at public places. Yes. Use an app that is definitely connecting to the site. Or. Check the https. Verify the url. Make sure the url is short enough to visually see tampering. Also, maybe some examples of homographic attacks. Not the answer you're looking for? Browse other questions tagged tls banks user-education user-interface usability or ask your own question. How to check if redirected site like OAuth is genuine? What to do in case of a weak certificate on my bank's website? How does Trusteer Rapport make accessing websites more secure?